NASHVILLE, TN (CelebrityAccess) — Iconic rock band the Eagles are teaming up with SiriusXM for a special, invitation-only concert for listeners of the satellite radio broadcast to be held at the Grand Ole Opry House in Nashville on Sunday, October 29. 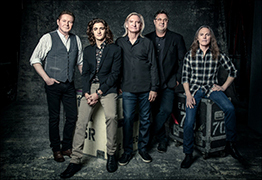 The show will be the first time the Eagles – Don Henley, Joe Walsh, and Timothy B. Schmit, with Deacon Frey and Grand Ole Opry member Vince Gill – have performed at the iconic venue. SiriusXM will broadcast the concert on the Eagles Channel, a limited run 'pop up' channel that will be live over the Thanksgiving Weekend. The channel will feature music from the band's back catalog, as well as records from the band's member's solo careers and influences. SiriusXM subscribers since September 12, 2017, can enter for the chance to win a trip to Nashville including airfare, hotel stay and a pair of tickets to the show.